In september Rubinstein Amsterdam will publish Kak! 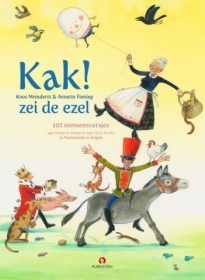 zei de ezel, a bilingual book of 101 nursery rhymes. To celebrate this, Annette Fienieg and Koos Meinderts, together with Rubinstein publishers, are holding a declamation contest. Recite one of the three nursery rhymes below, or the Dutch version, or both, and film it with smartphone or camera. Send your film(s) to info@koosmeinderts.nl before thursday september 8th. Koos Meinderts and I will choose 3 of the funniest, weirdest, best performances. Anyone and anybody, young or old, anywhere in the world. Lovely books, including ofcourse a signed copy of Kak! zei de ezel. The three winners will be anounced at the presentation of Kak! zei de ezel, on saturday september 10th at the Bonbon theatre in Amsterdam. mix it up and make it nice. Take a stick and knock it off. they went to sea in a bowl. The Dutch versions you can find on the Dutch 'side' of this blog.